My mom loves pizza. Its her favorite thing to eat. I love adapting grain-based favorites for a grain-free diet. 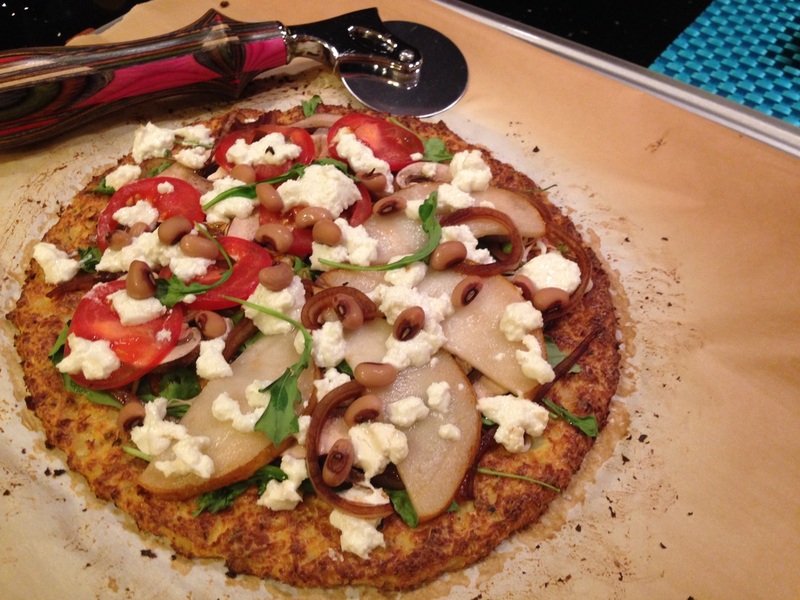 Thus the cauliflower crust pizza was born! A crust made out of riced cauliflower, egg and cheese that's sturdy enough to support the amount of toppings I am likely to pile on top sounds like a pipe dream. Its not. It exists and you'll find the recipe by clicking on the button above this text. In the picture on the left you'll see the proof. That's arugula, balsamic onions, pear, black eyed peas and goat cheese topping my crust. For my mom's half of the pizza I skipped the pears and added tomato. Both halves were great (mine was better) and all slices were pick-up-able. I followed the crust recipe exactly and will do the same the next time (because there definitely will be a next time) I make it.